Plundering from the past and tapping a present vein, Cloverfield succeeds on nearly every level. The film phenomenon was noted for marketing genius before it ever got into the theatres, when the unassuming trailer debuted before Transformers last summer. I spoke about J.J. Abrams creativity in a previous post. Watching the film he produced, with a rowdy midnight-showing crowd, kept me wide awake and riveted to my seat-edge for the jostling 90 minutes. The movie blends one of the first American giant monster movies with our modern methodology of amateur film-making, and the product is smooth as Slusho. The acting feels authentic and is consistent amidst the cast, with a natural style (unpolished, seemingly mundane dialogue) that maintains the illusion of “reality” we’re watching unfold. Most people probably won’t be as immediately familiar with the relationship of Cloverfield and The Beast from 20,000 Fathoms, but I have it conveniently on my DVD shelf and watched it the next morning. The New York setting, the arrival in the bay, and even a significance placed on Coney Island in both films leaves no possibility that the parallels are accidental. This 1953 classic, with a story by Ray Bradbury and a stop-motion monster crafted by the legendary Ray Harryhausen, ignited the giant monster movie explosion of the 50s. To illustrate, its success was copied in 1954 by a little Japanese film you might have heard of… called Godzilla. Later, when Godzilla was altered for American audiences in 1956, actor Raymond Burr was inserted throughout the film, as an American reporter bearing first-hand witness to the monster’s rampage. In Cloverfield, a monster invades New York, and Hudson – our single point-of-view amateur videographer – bears first-hand witness to the monster’s rampage, though for most of the film his camera tracks his buddy Rob and their ensemble through the devastated landscape. The single camera “Blair Witch” P.O.V. of faux-reality employed by Cloverfield brings these classic, 50s monster movie elements out of the atomic age and into the YouTube century, with an intensity not born of the monster’s ferocity but an acute sense of imminence and intimacy. You’re watching someone’s home video, only they don’t get a baseball in the crotch… people start dying. It’s like watching a very lethal episode of MTV’s Scarred, or getting to see the footage of Timothy “Grizzly Man” Treadwell and his girlfriend eaten by an angered bear. The conceit of the film’s opening is that you’re watching government property, recovered footage from a handcam, and this allows the film to set an odd pacing and jump-cut style that makes even Paul Greengrass’ Bourne movies seem steady. Some will complain about this style; my advice? Don’t sit too close to the screen, or you may indeed get disoriented and nauseous. The film’s ending, like the very nature of the film, is subjective and will undoubtedly have viewers debating its merit. I think the narrative ends precisely as it should have. 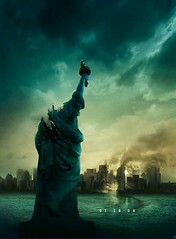 Cloverfield is an engaging movie that breathes new life into the monster/survival genre. It’s a roller-coaster ride to see with friends, and even to see more than once. It’s earned a place on the shelf next to my Beast from 20,000 Fathoms DVD, and I look forward to a home-viewing as a double feature. There have been some who have disparaged the film and it’s vivid destruction of New York as being “too soon” after 9/11 and the terrorist attacks on the World Trade Center. I won’t deny, during one scene where dust and debris rush down the street in a foreboding cloud, my mind went to both the televised footage of the event and the Oliver Stone film. Recent complaints have also been made about giant buildings being destroyed in both Spider-man 3 and Transformers. Not being in New York in September 2001, I don’t feel qualified to provide a definitive response. However, veterans of Normandy Beach were heavily impacted by Saving Private Ryan decades later. I suspect people at ground zero that day may always experience strong emotions watching anything of relative depiction. I hope in one way that I never forget the gravity of that historical event and that – even twenty years from now – a film with similar imagery will still bring it in mind. Solid review, James! I saw it last night and agree with you. There were definitely some folks in the theater who felt the ending was lacking (a “gyp”), but we don’t always get to know the whys and wherefores of what’s going on around us in our lives. The explanation of a crisis isn’t always as readily apparent as the crisis itself…if we are blessed to get to know, then we can use that information to our benefit; but if not, then we are still charged with trying to survive it, and to glorify God in doing so. And the attempt to save or redeem a loved one is just enough impetus to keep us going during horrible conflict. I think it’s sad that some folks will dislike or dismiss the film because of its ending, forgetting the tight context and style with which the film is offered: the 90 minute videotape. At some point, the tape just has to end, people. Went in with low expectations… heck the only reason I saw it was because a friend gave me free tickets to the movie. Well, I really enjoyed the movie. Even though I was a bit afraid of how annoying the camera movement would get, I think it really made the movie what it is. The ending was pretty haunting… not as haunting as the ending in “Blair Witch” with the guy in corner (yikes!). Anywho, great review. Thanks!